© Litinsky et al. ; Licensee Bentham Open. Statins (3-Hydroxy-3-methylglutaryl-CoA reductase inhibitors) exert favorable effects on lipoprotein metabolism, but appeared to possess anti-inflammatory properties among others, as suggested by their ability to inhibit collagen-induced arthritis in mice. Their activity in fibroblast-like synovial cells (FLS) has not yet been studied. To evaluate the effect of varying doses of simvastatin on apoptosis of FLS. Synovial tissue, obtained during total knee replacement due to osteoarthritis, was cut into small pieces and cultured in Petri dishes with test materials, as previously described. FLS were incubated for 48 hours with 1 μmol/ml, 5 μmol/ ml, 15 μmol/ml and 50 μmol/ml of simvastatin. Following incubation, apoptosis was analyzed by two-dimensional flow cytometry (FACS) using annexin V/PI staining according to the manufacturer’s instructions. Different concentrations of simvastatin induced apoptosis of FLS. The level proportion of apoptotic cells of resting or activated with lipopolysaccharide (LPS; 3 μg/ml) FLS, not treated with simvastatin, was 21%. At 48 hours, the rate of apoptosis of activated fibroblasts, incubated with 1 μmol/ml, 5 μmol/ml, 15 and 50 μmol/ml was 22%, 32%, 48% and 41% respectively. Synovial cell viability evaluated by tetrazolium salt XXT was unaffected by the simvastatin concentration used. Varying concentrations of simvastatin induce apoptosis of activated fibroblast-like synoviocytes, suggesting another possible mechanism of anti-inflammatory effects of statins in inflammatory conditions. Keywords: Apoptosis, inflammation, simvastatin, fibroblast-like synoviocytes..
Statins are potent inhibitors of 3-hydroxy-3methylglutaryl coenzyme A (HMG-CoA) reductase, the rate-limiting enzyme of the cholesterol synthetic pathway, and they are widely used to treat hyperlipidemia. The beneficial effects of statins have been attributed primarily to their ability to inhibit cholesterol synthesis. They block the conversion of HMG-CoA to mevalonate at the start of the cholesterol biosynthetic pathway with a subsequent increase in LDL-receptor expression on the hepatocyte, resulting in a further reduction of plasma LDL-cholesterol level . Although statins are considered to be the most effective drugs for treating hypercholesterolemia , the reduction in cardiovascular events observed in patients treated with statins is not fully explained by the reduction in LDL-cholesterol: this has been in part attributed to the ability of statins to modulate several mechanisms involved in the inflammatory process . Better survival of heart transplant patients treated with statins has been attributed to their immunomodulatory effects  and reports of improvement of Rheumatoid Arthritis (RA) patients  lend support to the clinical anti-inflammatory role of statins. Inflammatory processes are involved in atherosclerosis [3, 6]. A number of studies suggest that in addition to their lipid-lowering activity, statins may influence atherosclerosis and cardiovascular diseases through the down regulation of the inflammatory response . Statins has been shown to reduce plasma levels of TNF-alpha, sP selectin and IL-6 in long term survivors of heart transplantation and in patients with cholesterolemia, without known cardiovascular disease [8, 9]. Some in vitro experiments and studies in animal models have also found that these agents may down regulate inflammatory responses such as the production of pro-inflammatory cytokines, chemokines and adhesion molecules; these agents may also reduce the expression of inducible major histocompatibility complex (MHC) class II molecules by antigen presenting cells . Rheumatoid arthritis (RA) is a chronic inflammatory joint disease characterized by synovial proliferation and abnormal immune responses, eventually causing erosion of the affected joint. Marked infiltration of lymphocytes, macrophages, and plasma cells is observed in the synovial tissue of RA . Apoptosis of macrophages and fibroblast-like synoviocytes has been observed in rheumatoid synovium [12, 13]. It has been suggested that reduced apoptosis contributes to the synovial inflammatory process . In vitro statins were shown to exert a cytotoxic effect on human T, B and myeloma cells by promoting their apoptosis  and also modifying apoptosis of smooth muscle and endothelial cells leading to altered vascular function and neovascularisation . We studied the effects of different doses of simvastatin on apoptosis of fibroblast–like synoviocytes (FLS). Synovial tissue was obtained during surgery from 3 patients undergoing total knee replacement because of osteoarthritis (OA). Synovial cells derived from small pieces (~ 2mm diameter) of human synovial tissue was first grown in T 15 culture flasks, by methods described by Castor et al. . Then the cells identified as fibroblasts by the method of Castor  originating from the tissue samples were inoculated in T-15 culture flasks and incubated at 37ºC. Cell were grown as monolayers in 6 or 7 day growth (between on trypsinization and another), then trypsinized and replated until there were enough cells for an experiment to be performed . the culture medium consisted of RPMI 1640 supplemented by L-glutamine (2 mM) (Sigma, Israel), penicillin (100 U/ml), and streptomycin sulphate (100 U/ml) and 10% fetal calf serum (FCS, Bet-Haemek, Israel). Experiments were performed in 96 well plates containing 15-20×105 cells/well in a serum free medium for 48 hours at 370C (in 5% CO2). The LPS and simvastatin treatments were carried out with isolated cells in tissue culture cells and were incubated for 48 hours, using different concentrations of simvastatin: 1, 5, 15 and 50 μmol/ml. Stimulation of the cell culture (FLS) with lipopolysaccharide (LPS) was performed as previously described . After collection of the cells, the incubation period of the cells with simvastatin lasted 48 hours. The clinical research was conducted in accordance with guidelines for human experimentation specified by the Tel Aviv Sourasky Medical Center. The study was approved by the Ethics Committee of the Medical Center. After 48 hours incubation in varying concentrations of simvastatin, fibroblast-like synovial cells were detached and placed in a serum free medium for 48 hours. Apoptosis was analyzed by two-dimensional flow cytometry, using annexin V and propidium iodide according to the manufacturer’s instructions (Biotest). Flow cytometry was then performed using a Becton Dickinson FACSort flow cytometer (Becton Dickinson, San Jose, CA, USA). Events accumulating at the top and bottom right-hand quadrates simulated apoptotic cells. Cell viability in the presence of statins was determined in human synovial cultures by tetrazolium salt XTT assay at the end of the experiment. XTT is a tetrazolium derivative that measures cell viability based on the activity of mitochondria enzymes in live cells that reduce XTT and are inactivated shortly after cell death. XTT is readily reduced to a highly water-soluble orange colored. The amount of water-soluble product generated from XTT is proportional to the number of living cells in the sample and can be quantified by measuring absorbance at wavelength of 475 nm. Statistical analysis was evaluated by analysis of variance and by Student's t test. P values of less than 0.05 were considered statistically significant. Individual experiments were performed in triplicates. Results represent the findings from several separate experiments. Simvastatin induced apoptosis of human fibroblasts in a dose dependent manner. The proportion of apoptotic cells of resting or activated human fibroblasts lipopolysaccharide (LPS; 3μg/ml) not treated with simvastatin was 21% (Fig. 1). At 48 hours, the proportion of apoptosis of fibroblasts activated by LPS and incubated with 1, 5, 15 and 50 μmol/ml was 22%, 32%, 48% and 41% respectively (Fig. 2). The level of apoptosis of human fibroblasts, resting or activated with LPS in the absence of simvastatin. The level of apoptosis is among 19% to 21%. The level of apoptosis of resting or activated with lipopolysaccaride (LPS; 3µg/ml) human fibroblasts in the medium of synovial culture tissue not treated with simvastatin. Apoptosis was analyzed by two-dimensional flow cytometry using annexin V and propidium iodide according to the manufacturer’s instructions (Biotest). Events accumulating at the top and bottom right-hand quadrates simulate apoptotic cells. 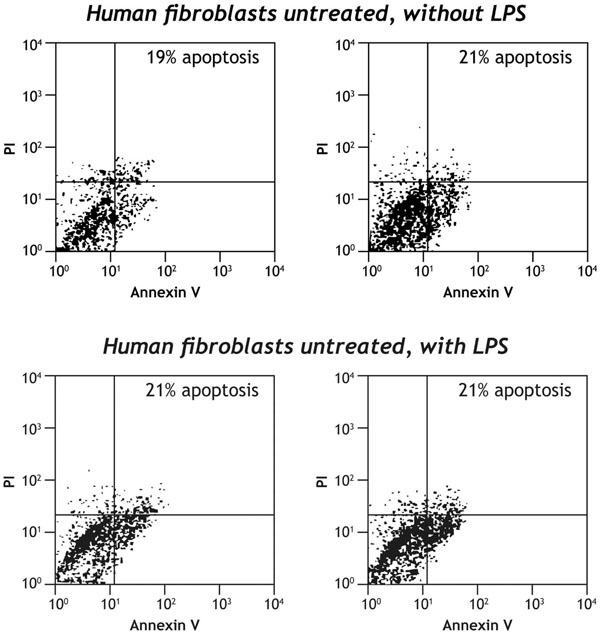 The levels of apoptosis of human fibroblasts activated by LPS, treated with different doses of simvastatin. A dose dependent apoptosis of FLS can be observed: the level of apoptosis under 1 mcmol/ml is similar to untreated cells while 15 mcrmo/ml of simvastatin induce apoptosis of more than 48 %. Dose-dependent effects of simvastatin on the levels of apoptosis of human fibroblasts-like synoviocytes in the medium of synovial culture activated by LPS (3µg/ml). The proportion of apoptosis of activated human fibroblasts-like synoviocytes was measured after 48 hours incubation with different doses of simvastatin: (A) Simvastatin 1 µmol/ml; (B) Simvastatin 5 µmol/ml; (C) Simvastatin 15 µmol/ml; (D) Simvastatin 50 µmol/ml. Synovial cell viability evaluated by tetrazolium salt XTT was unaffected by the simvastatin concentration used in these experiments . In this study, we have shown that simvastatin in doses within the therapeutic range causes a dose dependent induction of apoptosis of fibroblast-like synoviocytes activated with LPS. Despite the apoptotic effect of simvastatin, cell viability was not affected, suggesting that the level of apoptosis was limited. Our results are consistent with the data reported by Yokota et al. who have shown that high concentrations of simvastatin induce apoptosis of fibroblast-like-cells . Inflammation of synovial tissue in rheumatoid arthritis is a complex sequence of events involving different cell lines and many soluble factors such as cytokines and chemokines. A possible way to reduce the inflammatory burden may include an induction of apoptosis of cells involved in the inflammatory process. Several drugs, such as COX-2 inhibitors , methotrexate and corticosteroids  promote apoptosis of T cells. It has been recently shown that anti-tumor necrosis factor therapy with both etanercept and infliximab significantly increases apoptosis in the synovial monocyte/macrophage population . Lovastatine and cerivastatin exert a cytostatic effect on mesothelioma , glioma , neoplastic thyroid , acute myeloid leukemia , multiple myeloma cells  and lung fibroblast  by directly promoting apoptosis. In myeloma cells, the apoptotic pathway engaged by statins is mediated by mitochondria activation, rather than by the “death receptors”, and both caspases 3 and 9 appear to be directly involved and activated within the intrinsic pathway of apoptosis . Statins also enhance the rate of apoptosis in neointimal smooth muscle cells . Recently Nagashima et al. have shown that fluvastatin but not pravastatin, induced apoptosis in RA synoviocytes in a dose and time dependent manner . Consistent with this report our study has demonstrated that simvastatin may also induce apoptosis of synovial cells. Recent publications have identified a therapeutic use of statins in the treatment of various models of autoimmunity [33, 34]. Leung et al. have shown that simvastatin markedly inhibited not only developing but also clinically evident collagen-induced arthritis . Ex-vivo analysis demonstrated a significant suppression of collagen-specific Th1 humoral and cellular immune responses and reduction in anti-CD3/anti-CD28 proliferation and INF-γ release from mononuclear cells derived from peripheral blood and synovial fluid caused by simvastatin . Proinflammatory cytokine production in vitro by T cell contact-activated macrophages was also suppressed by simvastatin. Likewise, there are several indications suggesting a beneficial effect of statins on multiple sclerosis  and, in particular, in the mouse model of multiple sclerosis-termed experimental autoimmune encephalomyelitis . Youssef et al. have shown that oral statin treatment prevents chronic and relapsing paralysis and suppresses clinical and histological EAE. Statin treatment reduced CNS infiltration of TH1 lymphocytes and MHC class II expression, inhibited the activity of CD 40, CD80 and CD86 co stimulatory molecules, largely inhibited the secretion of inflammatory cytokines such as TNFα, INFγ and even induced the production of anti inflammatory cytokines . In conclusion, our results demonstrate that simvastatin stimulates apoptosis of human synovial cells in vitro. We are aware of the limitations of this study which assessed apoptosis by Annexin PI staining without confirming the results using other methods. Further research is warranted to establish the in vivo relevance of these findings. Recently, increased cardiovascular morbidity and mortality have been observed in several inflammatory rheumatic diseases, including rheumatoid arthritis (RA) , encouraging aggressive treatment of the inflammatory process, as well as vigorous neutralization of traditional risk factors of atherosclerosis such as hypercholesterolemia. Our study further supports the use of statins in this subset of patients, suggesting an additional anti immunomodulatory effect. Aguilar-Salinas SA, Barrett H, Schonfeld G. Metabolic modes of action of statins in the hyperlipoproteinemias Atherosclerosis 1998; 141: 203-7. Downs JR, Clearfield M, Weis S, et al. Primary prevention of acute coronary events with lovastatin in men and women with average cholesterol levels: results of AFCAPS/TexCAPS JAMA 1998; 279: 1615-22. Case CC, Ballantyne CM. Statins and inflammatory markers Curr Atheroscler Rep 2002; 4: 42-7. Bilchick KC, Henrikson CA, Skojec D, Kasper EK, Blumenthal RS. Treatment of hyperlipidemia in cardiac transplant recipients Am Heart J 2004; 148: 200-10. McCarey DW, McInnes IB, Madhok R, et al. Trial of atorvastatin in rheumatoid arthritis (TARA): double-blind, randomized placebo-controlled trial Lancet 2004; 363: 2015-1. Ridker PM, Rifai N, Clearfield M, et al. Measurement of C-Reactive protein for the targeting of statin therapy in the primary prevention of acute coronary events N Engl J Med 2001; 344: 1959-65. Ridker PM, Rifai N, Lowenthal SP. Rapid reduction in C-reactive protein with cervastatin among 785 patients with primary hypercholesterolemia Circulation 2001; 103: 1191-3. Torborn H, Andreassen AK, Ueland T, et al. Effect of pravastatin on plasma markers of inflammation and peripheral endothelial function in male heart transplant recipients Am J Cardio 2001; 87: 815-18. Rosenson RS, Tangney CC, Casey LC. Inhibition of proinflammatory cytokine production by pravastatin Lancet 1999; 353: 983-84. Jury EC, Ehrenstein MR. Statins: immunomodulators for autoimmune rheumatic disease? Lupus 2005; 14: 192-6. Gay S, Gay RE, Koopman WJ. Molecular and cellular mechanisms of joint destruction in rheumatoid arthritis: two cellular mechanisms explain joint destruction Ann Rheum Dis 1993; 52: S39-47. Firestein GS, Yeo M, Zvaifler NJ. Apoptosis in rheumatoid arthritis synovium J Clin Invest 1995; 96: 1631-38. Nagata S, Suda T. Fas and Fas ligand: lpr and gld mutations Immunol Today 1995; 16: 39-43. Cafforio P, Dammacco F, Gernone A, Silvestris F. Statins activate the mitochondrial pathway of apoptosis in human lymphoblasts and myeloma cells Carcinogenesis 2005; 26(5): 883-91. Muck AO, Seeger H, Wallwiener D. Class-specific pro-apoptotic effect of statins on human vascular endothelial cell Z Kardiol 2004; 93: 398-402. Castor CW, Bignell MC, Hossler PA, Roberts D. Connective tissue activation. XXI. Regulation of glycisaminoglycan metabolism by lymphocytes (CTAP-1) and platelet (CTAP-III) growth factors In Vitro Cell Dev Biol 1981; 17: 777-85. Castor CW, Prince RK, Dorstewitz EL. Characteristics of human fibroblasts cultivated in vitro from different anatomical sites Lab Invest 1962; 11: 703-13. Yaron I, Shirazi E, Yudovich R, Caspi D, Levartovsky D, Yaron M. Fluoxetine and amitriptilline inhibit nitric oxide, prostaglandin E2 and hyaluronic acid production in human synovial cells and synovial tissue cultures Arthritis Rheum 1999; 42: 2561-8. Roehm NW, Rodgers GH, Hatfield SM, Glasebrook AL. An improved colorimetric assay for cell proliferation and viability using the tetrazolium salt XTT J Immunol Methods 1991; 142: 257-65. Yokota K, Miyoshi F, Miyzaki T, et al. High concentration simvastatin induces apoptosis in fibroblast-like synoviocytes from patients with rheumatoid arthritis J Rheumatol 2008; 35: 193-200. Yim HW, Jong HS, Choi HH, et al. Cyclooxygenase-2 inhibits novel ginseng metabolite - mediated apoptosis Cancer Res 2005; 65: 1952-60. Pawlik A, Baskiewicz-Masiuk M, Machalinski B, Gawronska-Szklarz B. The effect of methotrexate and glucocorticosteroids on apoptosis of phythemaglutinin-stimulated mononuclear cells from peripheral blood Fundam Clin Pharmacol 2005; 19: 81-5. Catrina AI, Trollmo C, af Klint E, et al. Evidence that anti-tumor necrosis factor therapy with both etanercept and infliximab induces apoptosis in macrophages, but not lymphocytes, in rheumatoid arthritis joints: extended report Arthritis Rheum 2005; 52: 61-72. Rubins JB, Greatens T, Kratzke RA, Tan AT, Polunovsky VA, Bitterman P. Lovastatin induces apoptosis in malignant mesothelioma cells Am J Respir Crit Care Med 1998; 157: 1616-22. Jones KD, Couldwell WT, Hinton DR, et al. Lovastatin induces growth inhibition and apoptosis in human malignant glioma cells Biochem Biophys Res Commun 1994; 205: 1681-7. Vitale M, Di Matola T, Rossi G, Laezza C, Fenzi G, Bifulco M. Prenytransferase inhibitors induce apoptosis in proliferating thyroid cells through a p53-independent, CrmA-sensitive, and caspase-3 like protease dependent mechanism Endocrinology 1999; 140: 698-704. Wong WWL, Tan MM, Xia Z, Dimitroulakos J, Minden MD, Penn LZ. Cerivastatin triggers tumor-specific apoptosis with higher efficacy than lovastatin Clin Cancer Res 2001; 7: 2067-75. Van de Donk NWCJ, Kamphuis MM, Lokhorst HM, Bloem AC. The cholesterol lowering drug lovastatin induces cell death in myeloma plasma cells Leukemia 2002; 16: 1362-71. Tan A, Levrey H, Dahm C, Polunovsky VA, Rubins J, Bitterman PB. Lovastatin induces fibroblast apoptosis in vitro and in vivo. Apossible therapy for fibroproliferative disorders Am J Respir Crit Care Med 1999; 159: 220-7. Cafforio P, Dammacco F, Gernome A, Silvestris F, et al. Statins activate the mitochondrial pathway of apoptosis in human lymphoblasts and myeloma cells Carcinogenesis 2005; 26: 883-91. Erl W, Hristov M, Neureuter M, Yan ZQ, Hansson GK, Weber PC. HMG-CoA reductase inhibitors induce apoptosis in neointima-derived vascular smooth muscle cells Atherosclerosis 2003; 169(2): 251-8. Nagashima T, Okazaki H, Yudoh K, Matsuno H, Minota S. Apoptosis of rheumatoid synovial cells by statins through the blocking of protein geranylgeranylation Arthritis Rheum 2006; 54: 579-86. Youssef S, Stuve O, Patarroyo JC, et al. The HMG-CoA reductase inhibitor, atorvastatin, promotes a Th2 bias and reverses paralysis in central nervous system autoimmune disease Nature 2002; 420: 78-84. Leung BP, Sattar N, Crilly A, et al. A novel anti-inflammatory role for simvastatin in inflammatory arthritis J Immunol 2003; 170(3): 1524-30. Del Rinco´n I, Williams K, Stern MP, Freeman GL, Escalante A. High incidence of cardiovascular events in a rheumatoid arthritis cohort not explained by traditional cardiac risk factors Arthritis Rheum 2001; 44: 2737-45.